Grant Wilson is a professor of astronomy at Umass Amherst. Wilson’s research lies at the intersection of new cameras and telescopes that operate at millimeter and submillimeter (mm/submm) wavelengths and the science enabled by them; science with the potential to shed new light on how galaxies and the stars they hold, form and evolve. Wilson says, “The Milky Way has about two hundred billion stars and has been around for a long, long time in the history of the universe. We’d like to know how it came to be so? When we look at nearby galaxies we see the same thing: Billions, to hundreds of billions of stars. 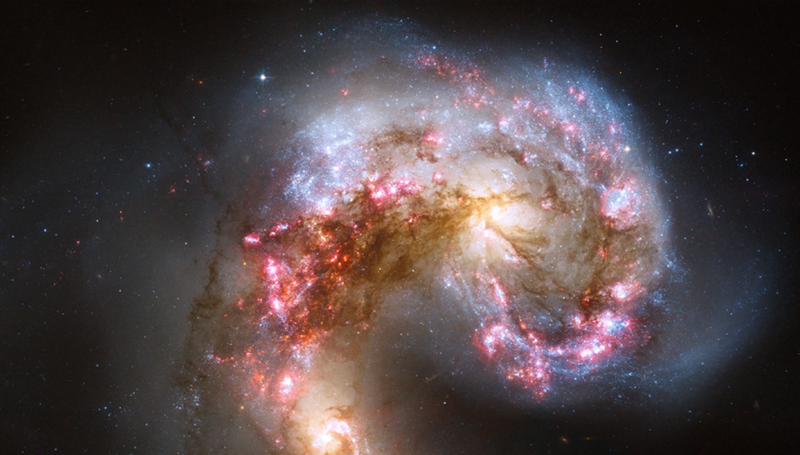 When did these galaxies get their stars? What were the processes by which gas in the galaxy actually got transformed into stars? Unlike in other wavebands in astronomy, where the further away an object is the dimmer it becomes, at millimeter wavelengths bright, dusty sources actually stay bright, even when they’re all the way across the universe, allowing astronomers to simultaneously capture both nearby galaxies and distant galaxies (dating from around when the very first galaxies formed) together in the same image at the same brightness. Although this is a disadvantage in that it masks a galaxy’s proximity, Wilson explains it is also an opportunity in that it reveals galaxies undetectable in other wavebands. “Because big balls of dust have a brightness that is independent of how far away that ball of dust is from us, we can image galaxies that even the Hubble Space Telescope is completely blind to,” says Wilson, adding that in some cases, the most distant galaxies can be the brightest galaxies in his image. For more than a decade Wilson, who observes at the LMT, the 50-meter diameter mm-wavelength telescope, run jointly by UMass and the Instituto Nacional de Astrofísica, Óptica y Electrónica (INAOE) in Mexico. The LMT is located at the summit of Sierra Negra, an extinct volcano in Puebla, Mexico. Wilson has been using AzTEC, a mm-wavelength camera built by a consortium that he led, to make his observations. But where AzTEC contains about a hundred detectors, Wilson’s team recently secured NSF funding to build a much larger replacement camera called TolTEC. “Since we built AzTEC about 15 years ago our community has learned how to multiplex detectors and make far larger systems. TolTEC, which will contain seven thousand detectors and observe in three different wavelength bands simultaneously, will yield an entirely new view of the dust enshrouded universe,” Wilson explains. A major challenge for all ground-based astronomy is the atmosphere overhead and, in particular at millimeter wavelengths, atmospheric water. Wilson says, “If you ask about all mm-wavelength telescopes on Earth, you’ll find them either at very high altitudes or in deserts. In the case of the LMT we’re on a mountain top at an elevation of fifteen thousand feet.” Even so, the residual water in the atmosphere above the telescope provides a competing signal that’s significantly brighter than the galaxies Wilson seeks to image, requiring him to do advanced computational manipulations and filtering to extract the relevant signal. “Because the atmospheric signal is about a thousand times brighter than anything we’re trying to look at, our work involves advanced computational techniques: principle component analysis, a lot of Markov chain Monte Carlo analyses,” explains Wilson. At the same time, using TolTEC will involve an enormous increase in throughput of data: TolTEC is set to produce about a terrabyte of data each night that it observes. To handle this, Wilson will install a high performance computational system at the MGHPCC to do the atmospheric subtraction calculations and then build the maps of the sky.